QB Jordan Lynch's last game for Northern Illinois didn't go as planned, as the Huskies fell to Utah State 21-14 in the Poinsettia Bowl. 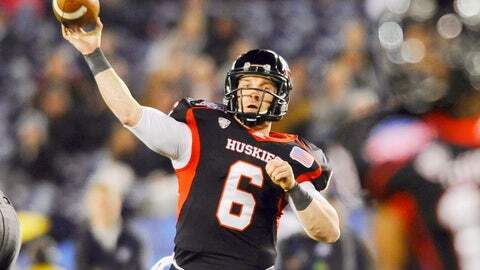 The initial plan for watching the Poinsettia Bowl between Northern Illinois and Utah State was to bid farewell to Huskies QB Jordan Lynch in a final, dominating performance. But the plans, as they often do, quickly changed. 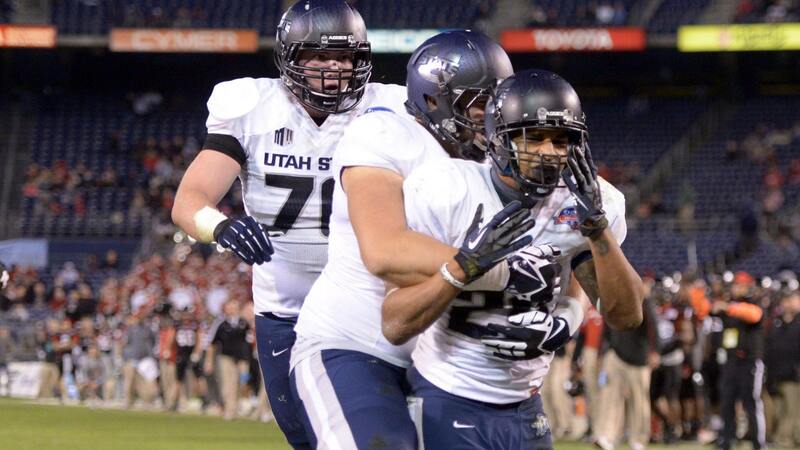 Instead, San Diego native and senior Utah State RB Joey DeMartino stole the national spotlight Thursday night, running for 143 yards and scoring what would be the game-winning TD from a yard out with 4:14 to go in a 21-14 win for the Aggies over the No. 23 Huskies. DeMartino certainly made himself at home (he also played junior college ball in San Diego), taking home offensive MVP honors. And he deservingly took a spot right in the center of the postgame celebration. So no milestone and no win for Lynch in his swan song performance with the Huskies, who suffered their second loss in as many games after a 12-0 start. "The carpet got pulled out from under us losing to Bowling Green and thinking about going to a BCS game," Lynch told The Associated Press about his team’s feelings after losing in the MAC championship game. "But we got a chance to play a great opponent in Utah State. I thought we had a great three weeks of practice. We came out with a lot of energy and had fun. 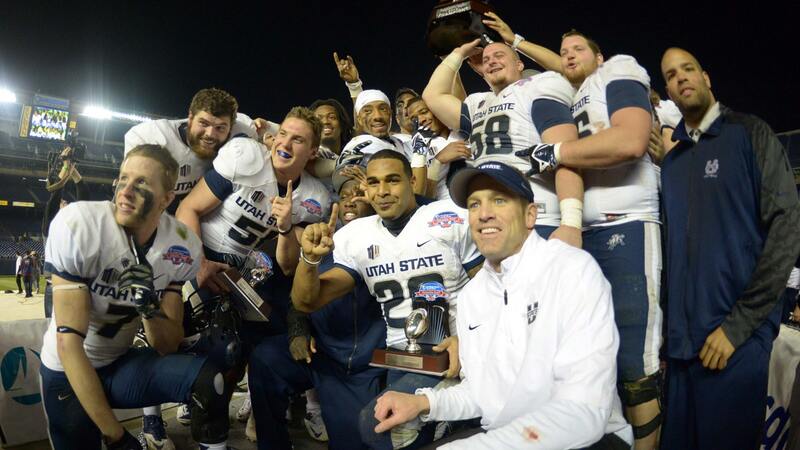 All the credit goes to Utah State." In what has become somewhat of a trademark of his game, Lynch was still able to find the end zone with his legs and his arm, keeping in line with the 42 rushing touchdowns and 49 scoring throws he has accumulated over the last two seasons. Lynch’s 1-yard plunge (shown below) represented the only TD of the half, and NIU entered the locker room holding a 7-6 lead over Utah State. Seizing the momentum, Utah State came out with a bang in the third, intercepting Lynch on his first throw in the opening drive of quarter. The Aggies transitioned Brian Suite’s diving pick into seven points when QB Darell Garretson found WR Brandon Swindall on a 5-yard toss for a 13-7 lead in the third. DeMartino’s rushing score and a successful 2-point conversion by the Aggies (9-5) inflated Utah State’s lead to 14 points, and became all the more important when Lynch found WR Juwan Brescacin with less than two minutes to play to cut the lead to 21-14. But the magic would end for Lynch and the Huskies, Utah State recovering the ensuing onside kick and running out the clock. But for the senior on the other side of the field, the one from San Diego, his college career ended the way kids dream — a bowl game MVP, a hero in front of his hometown.